hiTOPS Facebook page photoThe iconic hiTOPS sign in downtown Peterborough has come down, and been replaced with this sign pictured below for a new Thai restaurant. hiTOPS Chinese Restaurant had been undergoing renovations for sometime, but much speculation has surrounded whether it would in fact re-open with the same name and ownership. 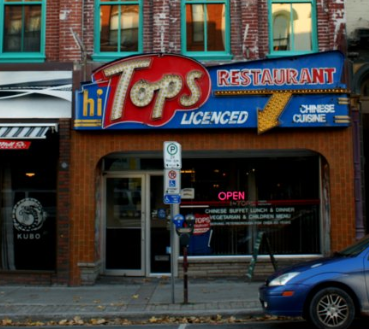 hiTOPS, and its facade, has been a landmark downtown. It has been locally owned and operated for four generations by the Hum family, and has been in business here for over 100 years. 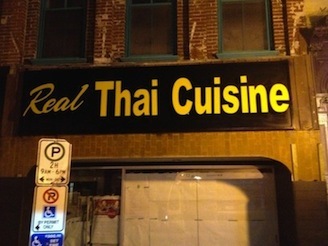 Now, in its place, is Real Thai Cuisine restaurant. No word yet from the hiTOP owners on what happened, and whether in fact they own this new restaurant.